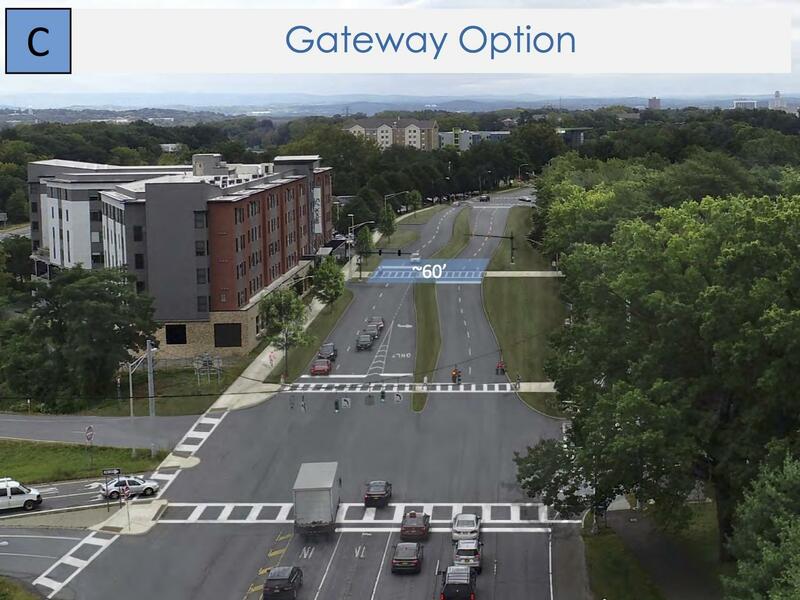 And a bonus option for possible converting one of the loop ramps between the Harriman State Office Campus and Patroon Creek into a pedestrian crossing with transit stops. The engineering team said the idea would have to be study furthered. The short answer is that the road as currently designed doesn't really work that well with the way people are using it. 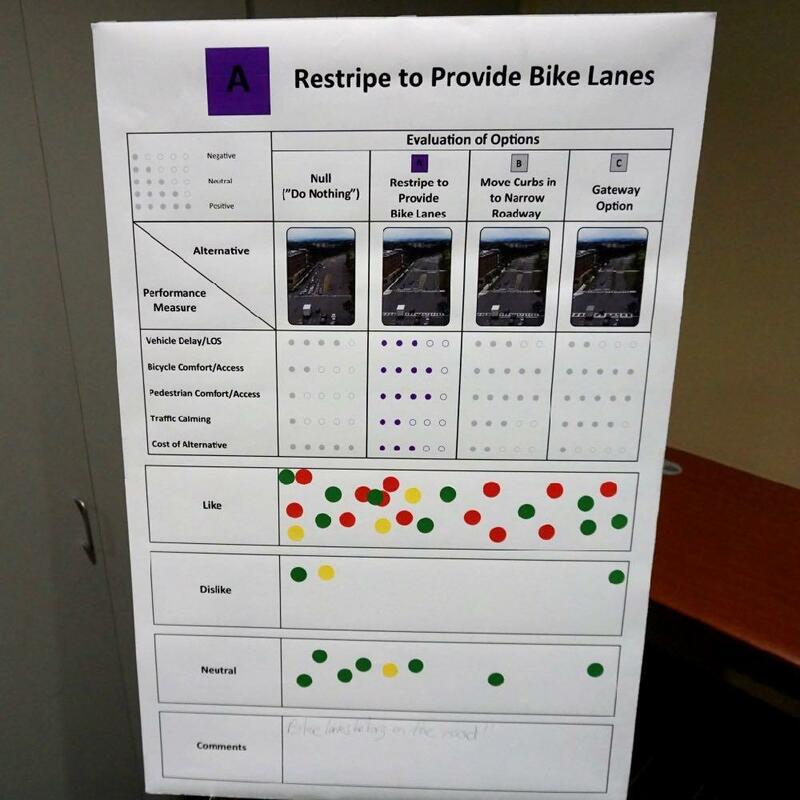 At a public meeting this past March people raised a whole range of concerns: speeding, a lack of pedestrian amenities, dangerous car-bike interactions, confusion over various the ramps that connect with the road. The problems have grown worse over the last decade or so because of the growth of offices, hotels, and apartments along the corridor. 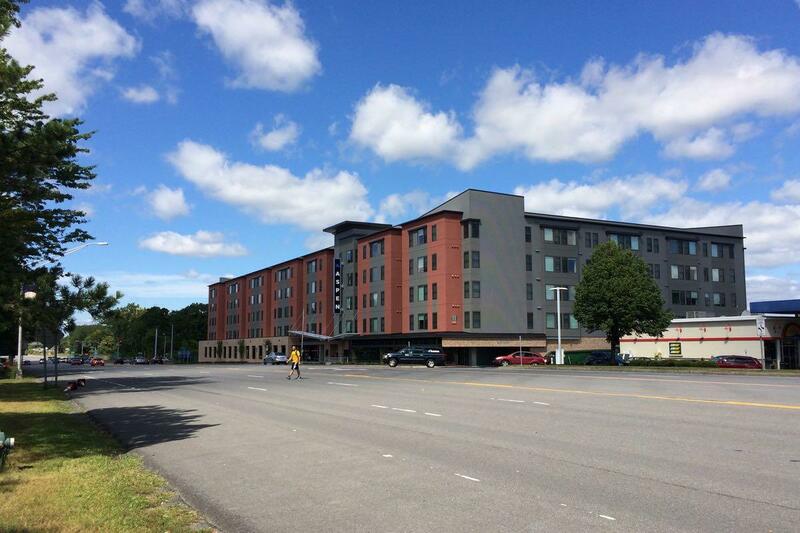 The construction of a private dorm across from UAlbany in 2016 raised the profile of the design issues after students starting darting across the street at various points. A second private dorm has since been built just up the road. In short: The road currently works OK for cars, except for the I-90 interchange at Exit 2. It's not good in places for bikes. And it's pretty bad for pedestrians because some sections lack any sort of sidewalk. 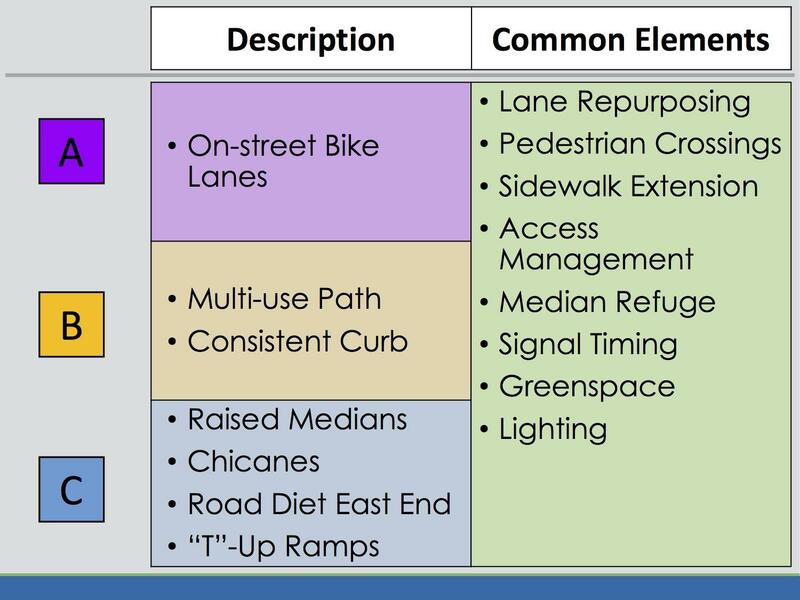 The options below differ in significant ways, but they also include some common elements: repurposing of lightly-used existing lanes, new pedestrian crossings, sidewalk extensions, medians that can act as pedestrian "refuges," new timing for traffic signals, new lighting. There are a handful of slides at the top in large format -- click or scroll all the way up to see them. 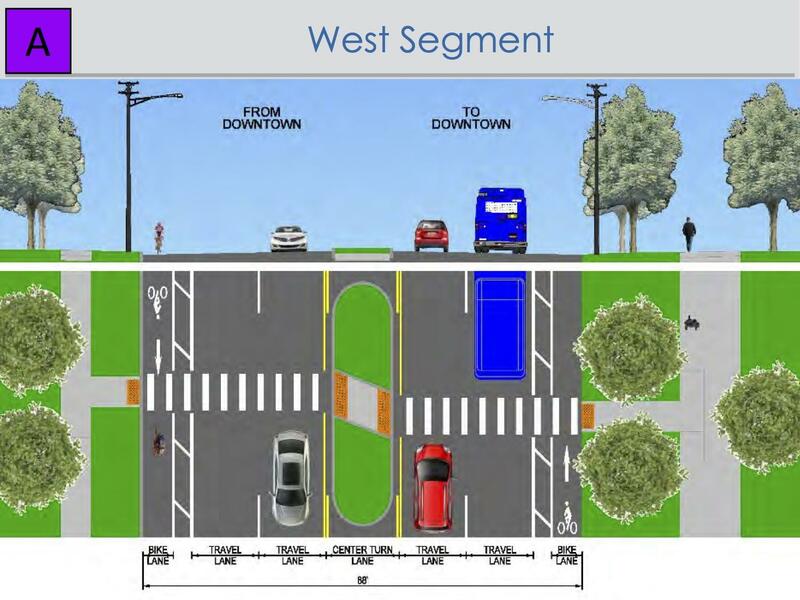 Option A would involve re-striping Washington Ave to include on-street bike lanes. 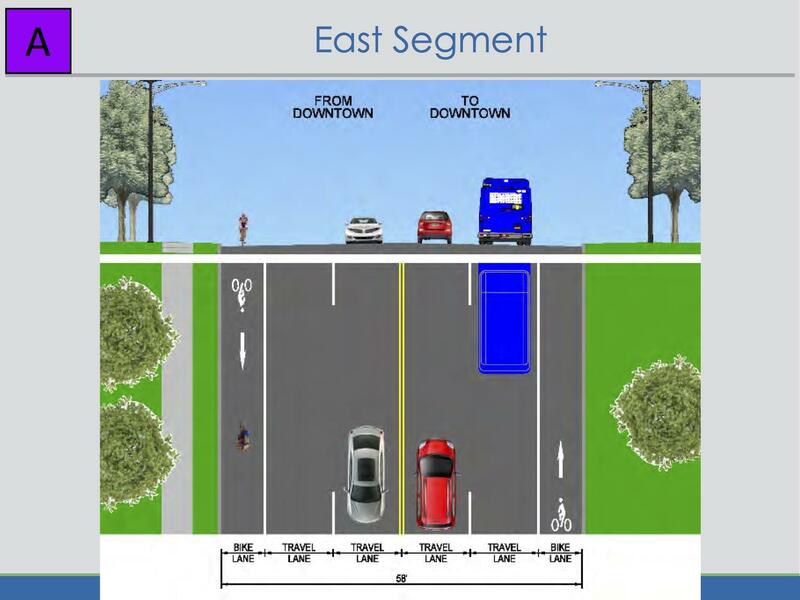 The new bike lanes, one on each side of the street, would be buffered -- that is, there'd be a strip marked out with lines to further separate cars from the bike lanes. The buffers would go away near the eastern end by Brevator. This would be the cheapest option because the road itself is largely staying the same. "It would be a very nice improvement for the corridor," Creighton Manning's Mark Sargent told the crowd. 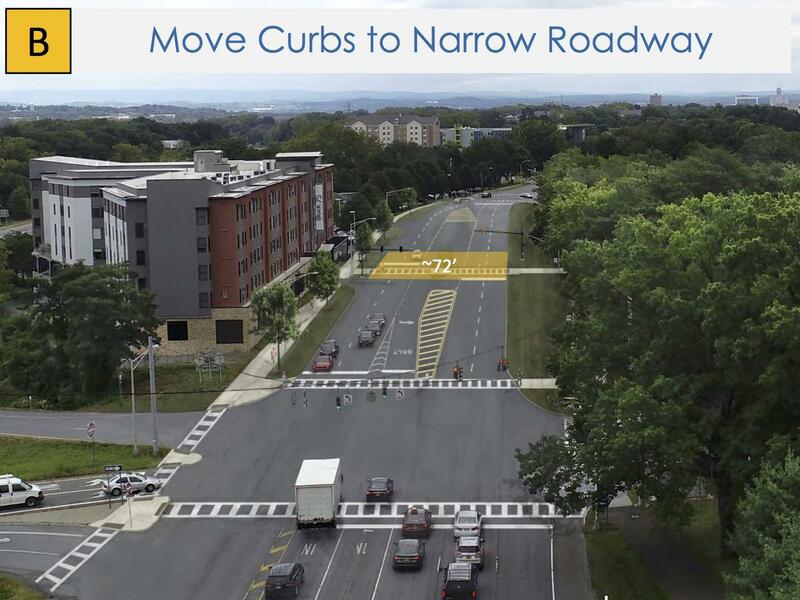 Option B would involve physically narrowing the road by moving the curbs in. 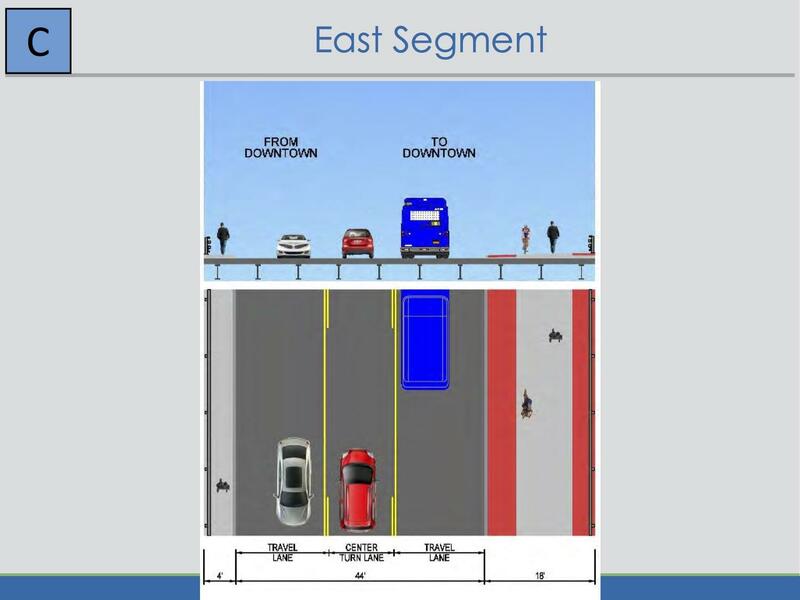 It would shrink the width of the road about 28 feet (to 72 feet wide) though there would still be two travel lanes in each direction. The design also includes a multi-use path for pedestrians and bikes -- sort of a super-sized sidewalk -- that would run alongside the road. 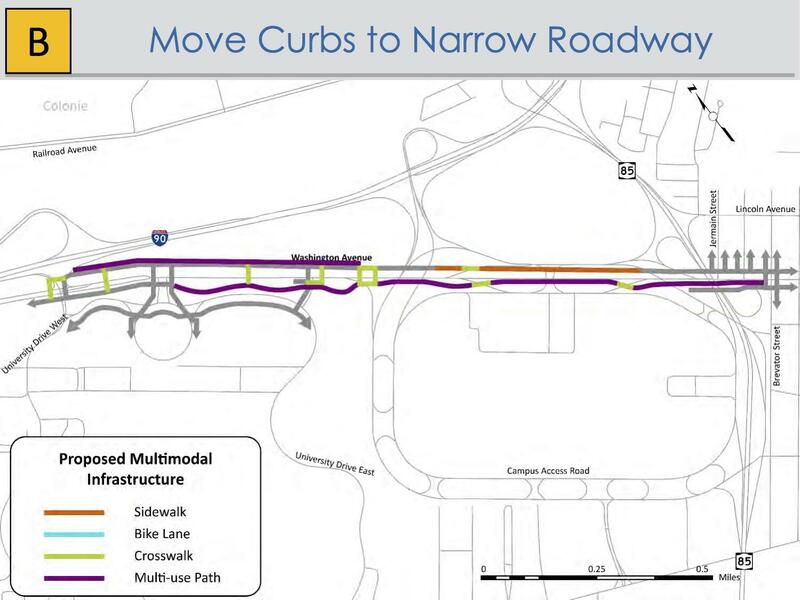 Option C would include a handful of significant physical changes to the road, narrowing the width by about 40 feet (to 60 feet) by the UAlbany campus. Curved bump outs from the curb -- the technical term is a "chicane" -- would be used in an attempt to slow and calm traffic on the western end. And on the eastern end near Brevator, the street would get a road diet treatment that would reduce it from two lanes in each direction to one lane each way with a center turn lane (similar to the new section of Madison Ave). Sargent called this the "most aggressive" option, and it would potentially slow vehicle travel times along the corridor by about a minute. It's important to note there's no money currently in place to pursue any of these options. So the best way to think about them is as a first step as the city considers a new direction. But as Chris Spencer, the city's commissioner of planning and development, said after the meeting, doing this planning work now can make it easier for the city to get the money later on for a project here. 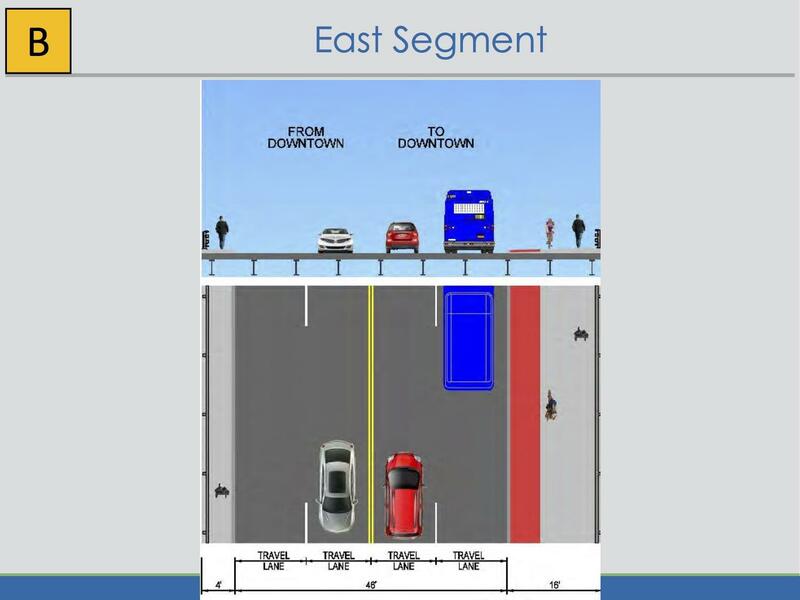 The Creighton Manning team stressed at multiple points in Thursday's presentation that any change to the road will involve tradeoffs, often between the speed with each cars can move through the corridor and amenities for pedestrians and bikes. And that's pretty straightforward. Some of the other tradeoffs might be a little bit less intuitive, though. 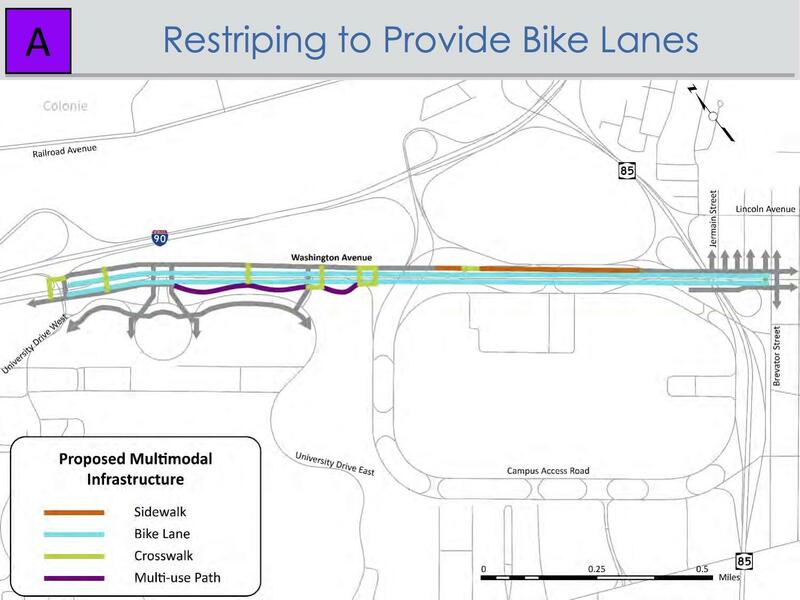 An example: Options B and C include the multi-use path that would be separated from the road. And separated paths are generally considered to be much more attractive to cyclists, especially people who aren't confident about riding in traffic. 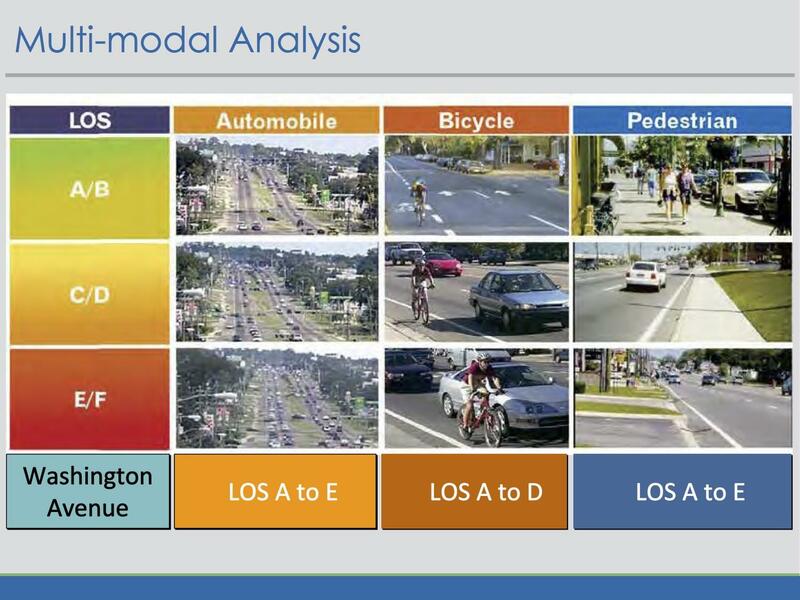 But as Sargent pointed, cyclists using the multi-use path would be expected to behave like pedestrians at intersections -- which would mean more stopping. And a few of the cyclists in the crowd Thursday noted that, as a result, they'd probably prefer to just ride in the road in that case. 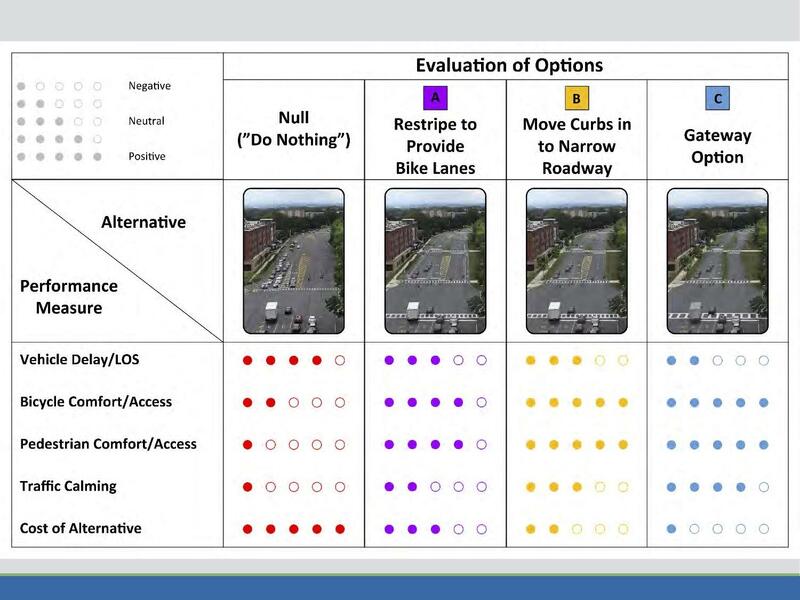 So, on first glance, it might appear that options B and C would be better for cyclists. But the reality might be that something more like Option A would be the preferred option for more people. 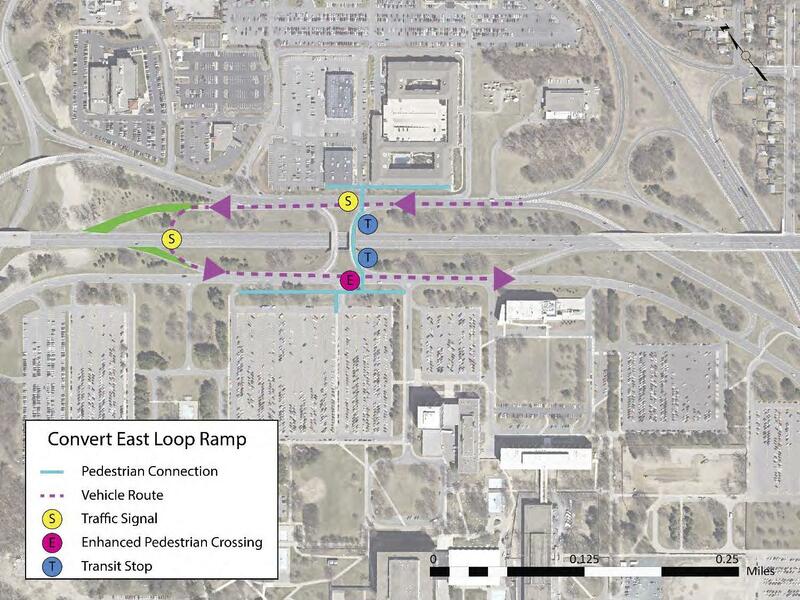 A sort of bonus option presented Thursday by the Creighton Manning team was an idea convert one of the loop ramps between the Harriman campus and Patroon Creek development into a pedestrian bridge and transit stops. They said the idea needed further study. 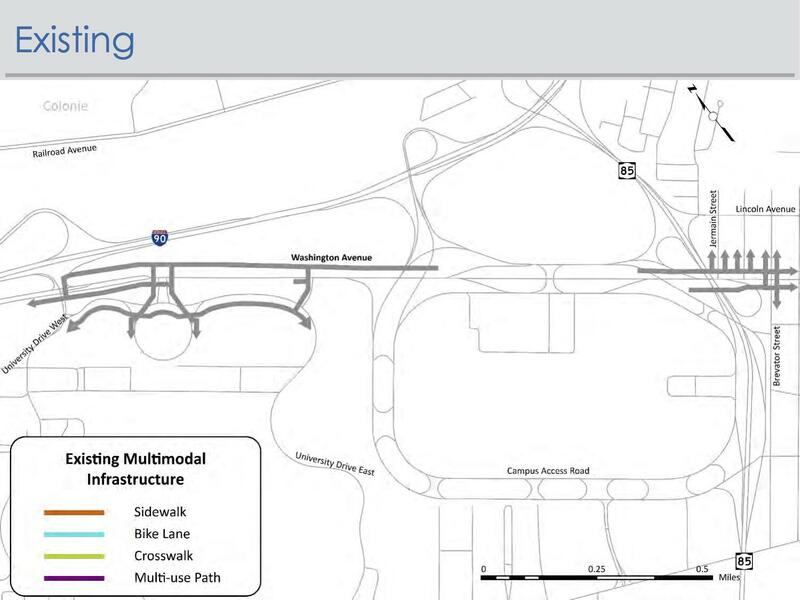 This study was limited to the stretch of Washington Ave from Brevator to the Exit 2 interchange. But it's hard to talk about a lot of the issues here without also looking at the various connections that extend beyond the corridor. 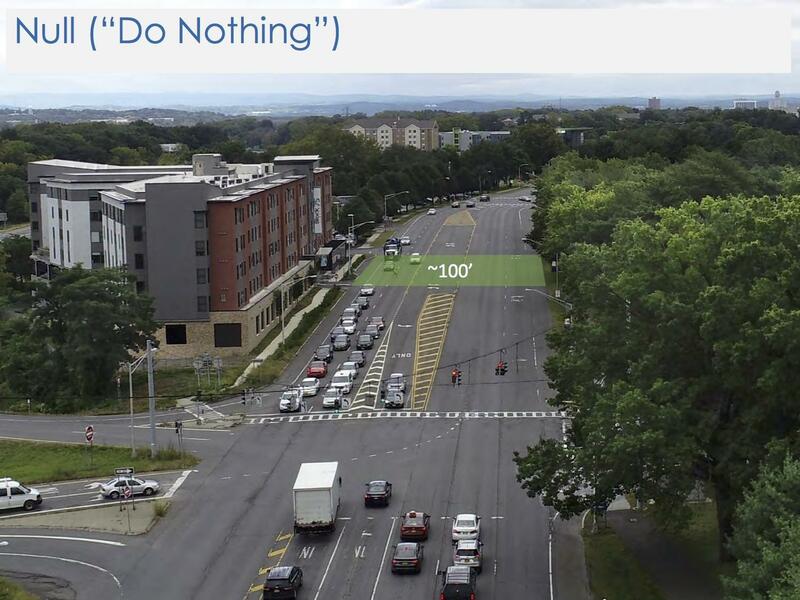 "I think what you see, as we went through the study with Creighton Manning, is that every time you have a study area everybody wants you to study something beyond that," said the city of Albany's Chris Spencer. "And the ramifications -- when you make one adjustment, you have to study a much larger area. It's a large game of Jenga." 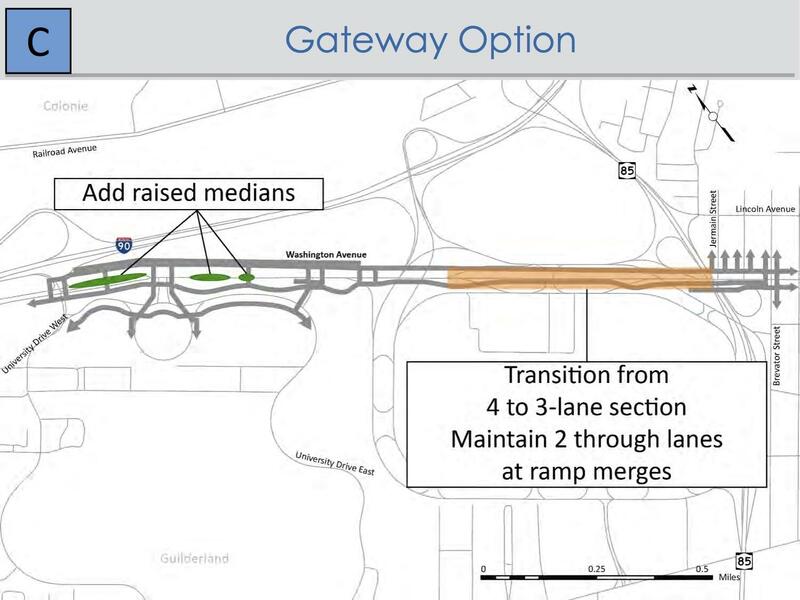 Some of the most important elements -- namely the Harriman State Office Campus and the clogged Exit 2 interchange -- are beyond the city's control because they're overseen by the state. So maybe the state and city can get together and work the problem over a larger area. 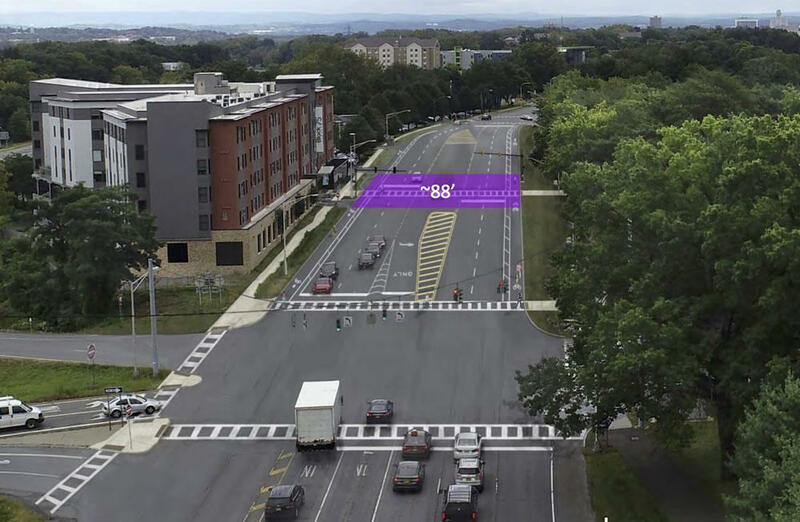 Speaking of a larger area: Chris Spencer said the city is looking for funding to do a corridor study of Washington Ave from Brevator to downtown, with an emphasis on connections between the two UAlbany campuses. 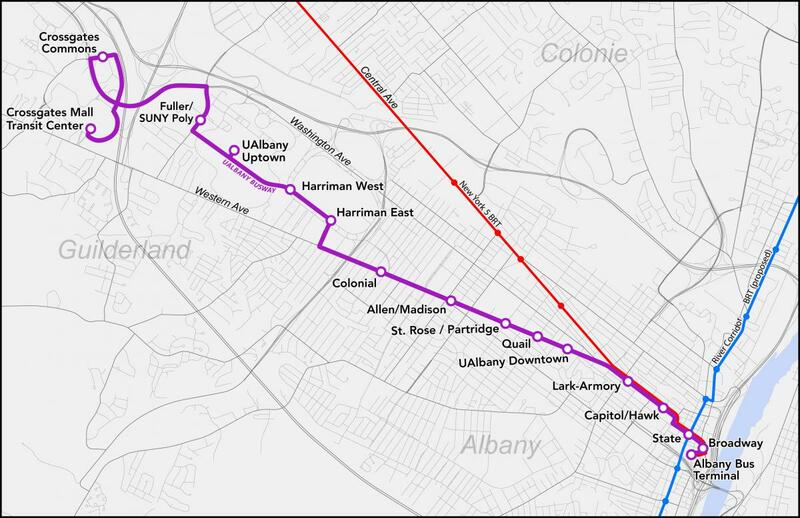 One of the things we were thinking about as we heard about congestion and traffic issues -- current and future -- at various points in this corridor: CDTA's proposed Busplus Purple Line, which would run from downtown to Crossgates along a route following Western Ave and through the Harriman and UAlbany campuses. One bus can carry the same number of people as a lot of cars. While it's not fair to say the problems along this upper part of Washington Ave were caused by the new private dorms there, it's not a stretch to say they've made the situation more acute. 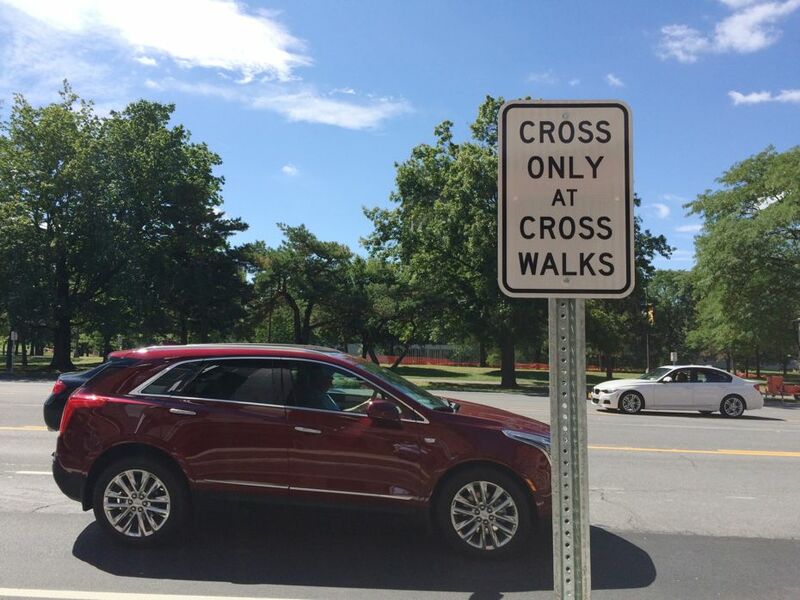 They're two major sources of pedestrians located on the other side of a wide road from a major pedestrian destination. 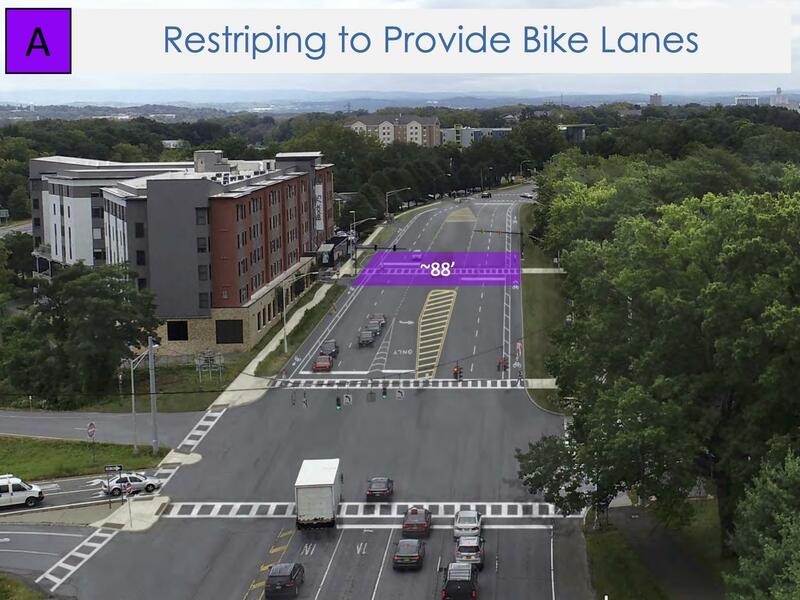 So it's worth asking whether developers in these sorts of situations should be asked (or required) to do more regarding street upgrades and/or pedestrian and bike amenities. Paying for a whole street project wouldn't necessarily be fair -- to use the Washington Ave example, there are many contributors to the issues there -- but having a developer chip in money toward a project (or fund for projects) could make sense. That could be especially true if a developer will be benefiting from tax breaks over many years. 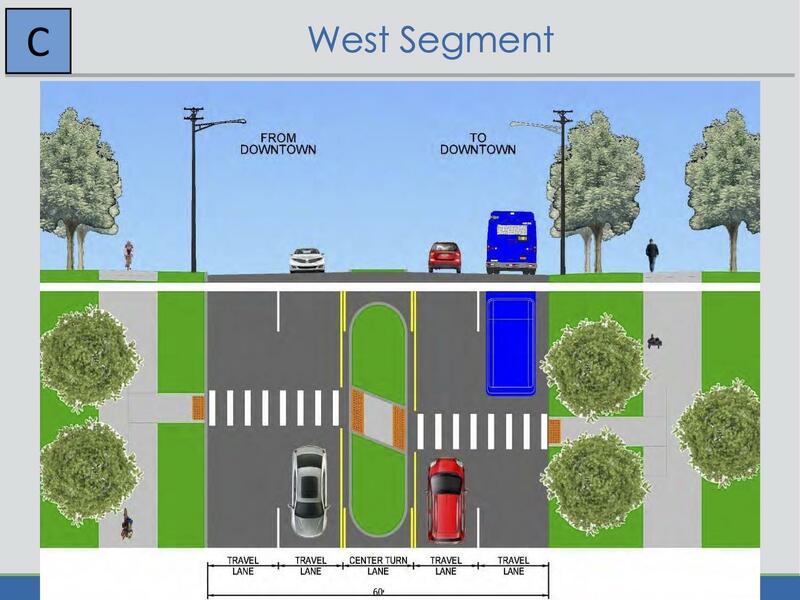 In some sense, this sort of approach would just be treating things like crosswalks and pedestrian medians and bike lanes like any other piece of infrastructure -- say, a new water line -- that supports a new development. Very nice redesigns. I hope that area becomes more of a neighborhood rather than what it currently is - still an expressway that happens to have hotels and apartments along it. I'd love to see wide sidewalks and protected bike lanes from Crossgates all the way to Manning. @anonymous: Thank you for the info and context! I was hoping for something more transformative, but to do that, the Harriman Campus ring roads would have to be included, and they're not under City control. Pity.